I will be the first to admit, I am a recent convert to squash. However, in my defense I would like to say that I never actually tried it until a few years ago. I don’t know what exactly held me off. Maybe it was the weird look of it, the odd name, or the fact that the same old folks who liked to drink buttermilk by the glassful and eat things like livers and poke sallet loved it so very much. I’m not sure exactly what it was which deterred me from squash but I do know that when I finally did taste it, I was won over in the first bite. Squash casserole is one of those dishes that varies so widely in recipes. I swear there are at least a hundred different variations out there. This one is my favorite. Gooey cheese, buttery cracker crumbs adding a hint of crunch, and the taste of garden fresh squash – even though I do use frozen most of the time. This is a cinch to make and very filling for a side dish. Alas, kids will likely give it a wide berth, but if they had any decent judgment in things they wouldn’t need parents, now would they? You’ll need: Cheddar cheese, onion, milk, eggs, margarine, Ritz crackers (or generic), and squash. I use fresh when it is given to me but if I am buying it, I just get frozen. Why? Well, I’m glad you asked that ~snickers~. I’ve found the quality and size of fresh squash in the grocery produce section to vary widely. It is rare to be able to find any decent sized squash that are still somewhat firm and if you do they are priced out the wazoo for the quantity you need. When you buy frozen squash, you get nice thick slices and a quality that has never been less than excellent from what I’ve seen. I can buy a bag of frozen squash for less than two dollars. To yield the same amount of nice thickly sliced squash from the produce section, I’d pay twice as much and likely end up with over ripe squash anyway. Perhaps it is different where you are but that is how it is in Bama. They were out of frozen chopped onions, so I had to do this the hard way. Cook over medium heat until squash and onions are tender. Meanwhile, back at the ranch….Crush your crackers in a bowl. Crack your eggs into the glass of milk. and stir well with a fork. Add half a stick of butter to your squash and let it melt. Then pour in the milk mixture. Stir in half of the cracker/cheese mixture. And pour into a casserole dish. Top with remaining cracker/cheese mixture and dot with butter. For me, dotting with butter means putting a few globs on top! Bake at 350 for 25 to 30 minutes or until browned. Preheat oven to 350. Put squash, onion, and about a cup and a half of water in a large skillet over medium heat. Cook until squash and onions are tender, about five to ten minutes. Drain well. Add half stick of margarine and let melt. In medium bowl, crush crackers and stir in cheese. Add salt and pepper, stir. Stir half of the cracker mixture into the squash. In small bowl, mix together milk and two eggs. Pour into squash mixture. Stir well. Pour into casserole dish. Top with remaining crumb mixture and bake at 350 for 25-30 minutes, or until top is browned. Oh Goodness I am a squash eater. Christy i could just eat the squash and the onions in the first couple pics b4 its all said and done with. Yummo, to bad i am the only one that east squash except my oldest son, now he loves squash reslish so i wonder if he would eat this with me????? never know. another great recipe. If the boy eats squash relish, sounds to me like he’s a pretty smart little guy! I bet you would have a partner in crime were you to make this! If he refuses, just give me a holler!!! You know, a lot of times I just slice a squash and put a tablespoon or water into it, then cover it with saran wrap and nuke it for a minute or two! Grandmama says we need to try it raw too, she swears by that! This casserole looks delicious. I’ll have to try it when my squash plant is producing lots of squash. Yum! I bet my kids would eat it. I sauteed a couple tiny squash for lunch yesterday, and they both ate it up. This is a super casserole one I have been making for several yrs.. I live only LOW CARB.. so here is the changes I made..
use about 1 cup crushed pork rinds.. instead of the crackers..in the dis… I do crush a few real Ritz mixed with some butter for the top.. perfect .. so far it has converted several…No Squash Eaters.. have a super day everyone…. But Mine always had hamburger and the onions cooked in the hamburger! But that was another 100 yr old recipe. I am so doing this one! Thanks for posting it! I made this casserole and did the tutorial a little over a week ago. I mentioned posting it last week but held off – I thought “no one is going to want a squash casserole recipe. It’s just too …country.” To me, it seemed good old country food but I thought my readers would balk at it for some reason (maybe because I balked at it all those years). I’ve learned my lesson!!! I’ve had such great response. I even stopped by a neighbors house today and she said “I am so glad you posted that squash casserole recipe today! I saw you were going to post it last week and I kept looking and waiting for it!”. My favorite way to eat squash is just sauteed with onions in a whole mess of butter and salt and pepper! Hey Christy! I haven’t had squash casserole in a while. I’ve just been cooking them up like home fries with zucchini and a lot of onions. And girl, there is no such thing as “too country”! Nikki: You know, you are absolutely right. Absolutely right….. This casserole looks good BUT I’ve got a suggestion for you the next time you make it. Leave out the milk and add a can of cream of chicken/mushroom soup. Instead of crackers add some sage stuffing mix. Add a dallop of sour cream and you will have a casserole that people will talk about for a loooooong time. People that hate squash love this squash casserole. You would cover the top with a mixture of stuffing and cheese…not a lot…just enough to add a little cheesy crunch to the top. Instead of cooking my onion in the water with my squash I mince my onion up real small and let the flavor cook up into the casserole. This is just a suggestion. I’m loving your site. I love to cook but have lost touch with my kitchen since I started a lifestyle change last January that involves healthy eating. I’m forty four pounds smaller but am missing my southern cooking. I’ve got about forty more pounds to go so I won’t be cooking any casseroles for a while. Bummer:-( What really sux is that I got a 400.00 stand mixer for Christmas and haven’t even taken the cover off of it. None of this healthy stuff requires a lot of imagination. If anyone knows of a blog packed with good, healthy recipes would you please point me in the right direction? Thanks to all of you for posting the delicious recipes. I have to view your blogs with a drool rag! 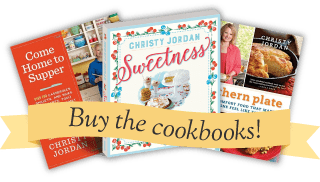 Gail, many of my dessert recipes on Southern Plate are ones that I use low sugar products in or substitute Splenda for when making them for myself. I have a post coming up which will detail those! I have a really good recipe as well, omit crackers, add small pan or a couple of big pieces of cornbread, and cream of mushroom soup. 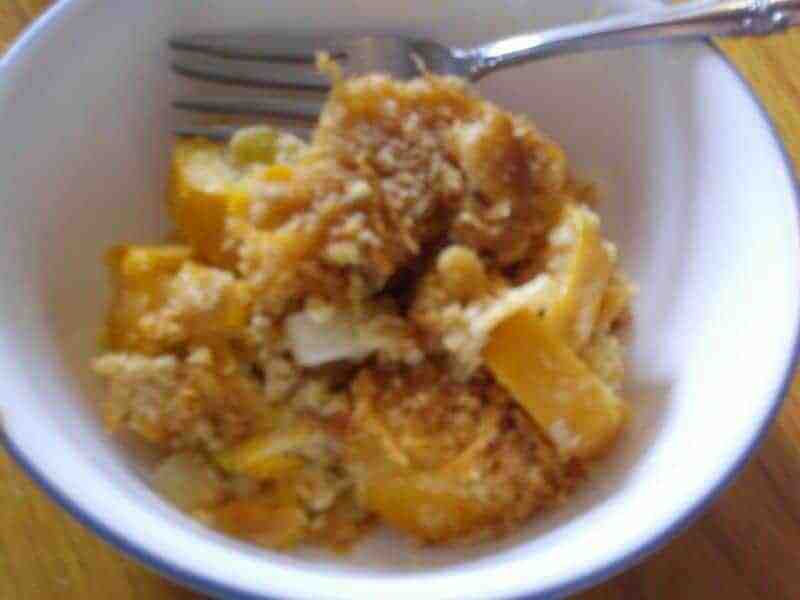 Mix squash/onions, cornbread crumbles, soup, some margarine/butter, salt/pepper, 1/2 the cheese and one egg. Put in dish, cover with remaining cheese and back until brown and bubbly. Yum, my grandma’s recipe, tastes alot like dressing! Great with mashed potatoes and a salad. Thanks for a GREAT way to show how to prepare a recipe!! I’m trying it to take to my sister’s house for Easter Sunday and I love all your detail and pictures. Thanks for posting this recipe…..it’s the very one my grandmother used to make except she uses saltine crackers!!! It’s just yummy!!! I’ve purchased above ingredients and am going to make this end of the month with our turkey dinner! I’m going with the dressing and soup suggestions. Thanks for sharing. Yum !!! reminds me of being at my grandmas house in the country, when I was a kid. Thanks for the recipe. I made this as a side dish and everyone absolutely loved it. I did a few alterations to it though to liven it up and give it a buttery sweet & salty taste. Because of a member of the family being on a soft food diet, I had to chop the onions and squash up into really fine pieces using a hand chopper so when it cooked it became more of a quiche type texture. I chopped up 1/2 of a Vidalia onion and about 5 small fresh squash (skin off) and sauteed them in a pan with the butter until soft and creamy. I then added a tablespoon of white sugar, a teaspoon of Nutmeg, a teaspoon of Vanilla extract, and about a teaspoon of Paprika. I then simmered the mix for 3 mins, turned off the flame and added about 5 eggs and a half cup of milk. Place the mixture in a glass or ceramic deep dish. Pour a mixture of crushed Ritz crackers & shredded sharp cheddar cheese on top covering the mixture. Bake for about 40 mins then take a long spoon and mix it up while in the dish and allow 5 more mins to cook. (This will help the crumbs absorb the excess water from the squash). I know it sounds an odd combination but it made an interesting dish that left an empty before dinner was half over. I’m excited to find a recipe for squash that will please my kids! Thanks. Slice yellow squash, zuchinni, onions and tomatoes, add garlic. Add salt and pepper. Sprinkle olive oil over it and bake. Easy and delicious! I loved this recipe. It was a “cinch” and really good. My ONLY suggestion was to use FRESH squash. I actually did cook it both ways and didn’t care for the frozen AT ALL. I could tell a big difference. Loved this! And so did my family! I didn’t have cheddar cheese, so I used shredded Mexican cheese, and it was delicious! These comments reminded me, I once had a recipe for a squash,coconut pie. I’m sure it had eggs and sugar in it too. You made the filling and poured it into a pie shell and baked it. Does anyone know the recipe. It’s one of those you don’t write down because it’s unusual and you know you’ll never forget it ! Well, I forgot it !! The first time I made this recipe, which was on July 19th, my Italian husband comes home from work while it was in the oven and asked “What stinks?” I told him it was his dinner!! Well, he actually tried it and loved it! We just got back from his surprise 50th birthday party that his niece graciously offered to have at her house, I made it again, and all of his relatives loved it, too! That’s why I’m back here again, I’m making copies for 3 of his nieces and his sister-in-law. Thanks Christy! It’s a keeper!